(Bloomberg) -- Weeks after a brand-new Lion Air 737 Max crashed in October, U.S. officials began probing the Federal Aviation Administration’s approval of a software system linked to the accident and why Boeing Co. didn’t flag the feature in pilot manuals, according to people familiar with the matter. The inquiry into the Maneuvering Characteristics Augmentation System, or MCAS, has taken on new urgency since an Ethiopian Airlines 737 Max 8 fell from the sky in a similar fashion to the Lion Air plane minutes after taking off from Addis Ababa earlier this month. In the aftermath, regulators around the world grounded Boeing’s best-selling jetliner while the U.S. Transportation Department ordered a full audit of the Max’s 2017 certification. The Justice Department is also using a grand jury to help gather information, Bloomberg has reported. For months, investigators representing the two departments and the Federal Bureau of Investigation have been digging into a range of matters related to MCAS, a stall-prevention measure that pilots were battling throughout the doomed Lion Air flight, said the people, who asked not to be identified since the the probe is confidential. A law enforcement agent with the Transportation Department Inspector General’s office contacted at least one FAA official a few weeks after the Indonesia crash to ask about how MCAS was certified, said one of the people. Another facet of the probe has explored why pilots were widely unaware of the system, said another person. The MCAS feature was added to the Max to guard against the threat of stalls in certain circumstances. 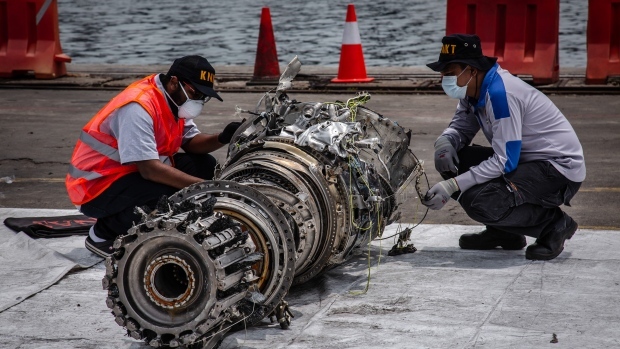 The system had baffled pilots by pushing the Lion Air plane’s nose downward dozens of times, exerting more and more force until they lost control. The same measure had kicked in with alarms blaring shortly after takeoff on a flight the evening before the October crash. A pilot riding in the jumpseat suggested the crew flip switches that cut power to the haywire system. The software patch was supposed to counteract the changed center of gravity on the Max, which boasts larger and more powerful engines than its 737 predecessors. The MCAS intervenes automatically, without a pilot’s knowledge, when a single sensor indicates the aircraft may be approaching a stall. The so-called angle-of-attack vane provided a faulty reading to the Lion Air crew. Separately, a Seattle Times investigation published Sunday found that U.S. regulators delegated much of the plane’s safety assessment to Boeing and that the company in turn delivered an analysis with crucial flaws.